Princess Cruises has released an unscripted video of a Cheshire couple’s thoughts on their very first cruise experience. The video is narrated by first-time cruisers Jo and Richard who discuss their Mediterranean cruise holiday experience. The self-confessed workaholics admit their work-life balance is tipped towards the work part as they spend most of their time running their own business together. After 16 years of marriage the couple were keen to rediscover some cherished time together. In the video Jo comments: “it’s so easy to lose perspective and sometimes we don’t take time to enjoy each others company”. The video captures the reactions of the pair as they discover new places in a new way, and as they enjoy time away from their busy lives rediscovering the joy of each other’s company. Jo and Richard relished the opportunity to spend quality time with each other in an environment where they could switch off from their daily responsibilities. In the video Jo explains she was surprised at how quickly they slipped into a relaxed cruise mode, leaving their stresses behind on the first sail-away at Civitavecchia. Jo recommends the Mediterranean as a great place to explore, with a bounty of destinations to visit and new adventures to be sought. She recounts one favourite memory as hiring a convertible Fiat 500 and driving along the scenic coastal road to Portofino with the roof down. Richard adds that the holiday experience was full of opportunities to learn new things each day. As for the cruise itself, the couple enjoyed that experience too. Waking up in a new place each day was a key highlight. The holiday also presented opportunities for the couple to do things they hadn’t for years, such as dressing up for a formal night dinner, or snacking on popcorn as they watched a movie under the stars. Richard comments that the experiences injected fun and laughter back into their relationship. 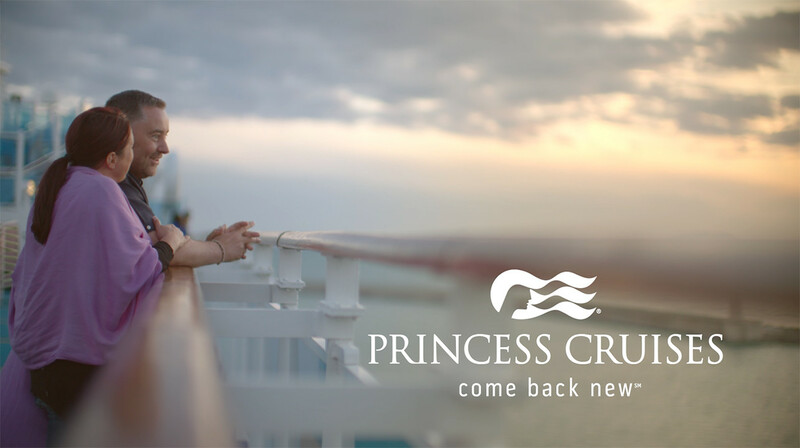 Princess Cruises hopes the video will inspire potential new customers by demonstrating what they mean by their ‘come back new’ slogan.